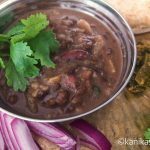 Mahn di Daal – Whole Black Lentils — Kitchenpostcards The King of Dals! A delicacy that is so ubiquitous in north-western India, specifically Punjab, that it’s taken for granted that a dinner party in those parts will have it. Whole black lentils or sabut urad in Hindi is also known as ‘Mahn di dal’ in Punjabi. Mahn di dal is often made by itself without any other lentils. But the recipe here is different, I prefer mah di dal with a hint of kidney beans and split gram. After some conversations and questions I still do not know conclusively why this dal is called ‘mahn’. But it seems that it’s stature and the ‘wholeness’ of the lentil earned it this name. I am still digging and hope to get answers from linguist friends. In the meantime, nothing’s stopping us from cooking potfuls of mahn di dal and savouring it with friends and family! Thali with Mahn di Dal, Fresh Roti, Green Chilli Pickle and Onion Salad. This version of the dal is closer to dal makhani, literally buttery dal, except that it doesn’t have butter or any other dairy. Instead I cook a mix of black lentils, kidney beans and split gram (chana dal). That’s how my mother cooked it, although she also made a version which included some milk or curd. But quite frequently, her version of this dal was requested by friends. That’s how good it was! Commonly served in gurdwaras during langar (communal meal), kaali dal (black- from its color) becomes thick and creamy if cooked over low heat for a long long time~45 mins to an hour, most of it in a pressure cooker. It is so much simpler than it sounds! 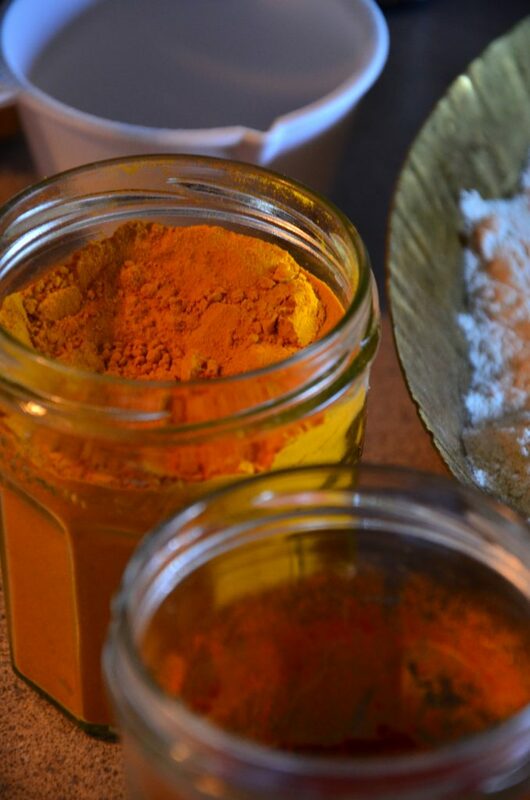 When inviting guests over for an Indian meal, this is an essential part of the menu. So next time, you want to surprise your friends and family, try mah di dal. Read on for the recipe. 20 mins inactive; 45 mins to 1 hour, active cookin. Perfectly cooked – soft and creamy. First– wash and soak the lentil mix. Ideally, soak for 2-3 hours until they are soft and swollen. But, I don’t always have time and I guess you don’t either to plan ahead. A good wash and soak for 30 minutes to an hour will suffice. Next, transfer to a pressure cooker, add salt and turmeric powder. Steam on high until you get the first whistle. Then reduce the heat to medium and let it cook for another 40-45 minutes. In all, the dal mix must cook for 1 hour. When steam has escaped and it’s safe to open the cooker- check for consistency. If it looks like the above batch- black lentils have broken open and are mushy- then you are good to go! Otherwise, add just about a cup of water and let it steam on medium high for another 15 minutes. While the dals cooks, go ahead and prep for the tempering- chop and slice tomatoes and onions as well as garlic and ginger. After the steaming and boiling it’s time to add flavour by making our tadka. For the tempering you need to heat a pan, add oil to it and then whole spices- cumin seeds, black cardamom, cloves and bay leaves. Once cumin seeds start spluttering, add garlic, followed by onions. Saute onions until they start caramelizing, then add tomatoes. Cook well. To this add a teaspoon of red chilli powder and 2 teaspoons of coriander powder. Stir and mix on low heat. The key is to avoid burning these spices. Finally, this is where the magic happens. Transfer the tadka to a pot of hot lentils and mix well. Keep it on low heat for a few minutes with the lid just resting- don’t close to build steam. Mixing Tadka in the Dal. Mahn di dal is ready to be served with hot chapatis, some hot chilli pickle, sliced red onions and plain yogurt. Yummy! This is what weekend dinner and dreams are made of! Dal for a hearty meal. This is the ultimate when it comes to lentils - wholesome, luxurious and delicious! Try the mahn di dal part of a typical Punjabi meal today! First– wash and soak the lentil mix, ideally for 2-3 hours until they are soft and swollen. Next, transfer to a pressure cooker, add salt and turmeric powder and steam on high until you get the first whistle. Then reduce the heat to medium and let it cook for another 40-45 minutes, in all the dal must cook for 1 hour. When the steam has escaped and it’s safe to open the cooker- check for consistency, if lentils have broken open and are mushy- then you are good to go. Otherwise cook for another 15 minutes. For the tempering heat a pan, add oil to it and then whole spices- cumin seeds, black cardamom, cloves and bay leaves. Once cumin seeds start spluttering, add garlic, followed by onions and saute until onions start caramelizing, then and tomatoes. To this add a teaspoon of red chilli powder and 2 teaspoons of coriander powder, stir and mix on low heat to avoid burning these spices. Transfer the tadka to a pot of hot lentils and mix well. Keep it on low heat for a few minutes with the lid just resting- don’t close to build steam. Mahn di dal is ready to be served with hot chapatis, some hot chilli pickle, sliced red onions and plain yogurt.